Performs to a high standard, reasonably priced, modern looks. The colour scheme may not suit all kitchens. Aimed at the modern kitchen is the RHM2064D Desire from Russell Hobbs, a slick looking microwave finished in a fairly unique red and black colour scheme. The main body of this solo microwave is completed in black, with the controls detailed in a contrasting red colour - overall our testers liked this design, although it probably won't suit all kitchens, it still drew praise. Providing a 20 litre capacity, and 800w of power, it features 5 different power levels and several auto cook options for ease of use. The turntable is removable for easy maintenance, and overall our testers found this model to be pretty easy to use. The controls are pretty well labelled, which made operating this appliance easy, and overall construction of the Russell Hobbs RHM2064D was also good - we envisage this microwave lasting well against wear and tear. Overall the Russell Hobbs RHM2064D works well, offers good value and looks great. 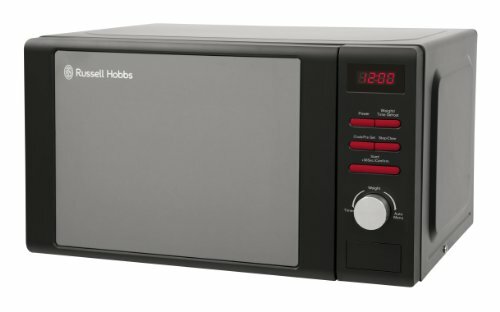 It should be reliable based upon our experience of Russell Hobbs, and is well worth considering if you're looking for a cheap solo microwave.